It's decently rare that a film will come along like The LEGO Movie (2014), that fires so well on so many multiple levels at once. It's a scathing critique on both commercial and cultural homogenization, as well as unfettered individualism. It owns a complex dual narrative between the fantasy of a child and the interactions within its meta-world. It blows up tropes while being a hilarious and smartly-written adventure flick. And all the while it really captures what it's like for kids to play with the source material - it's a fantastic advertisement for the LEGO brand. So, with plenty of SPOILERS to come here, let's talk about all these individual pieces. Wha-ho! symbolism. This movie is incredible. 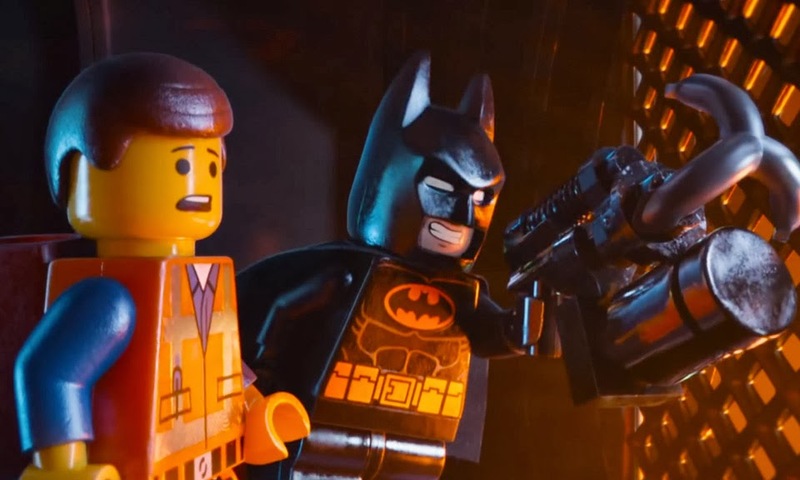 The first thing The LEGO Movie does is straddle this line between extolling the dangers of pure cultural homogenization through corporate control that stifles individual creative ideas as well as the unbridled danger of chaotic pure creative thought. The first few sequences admirably demonstrate that Emmett exists in this world of cultural control secretly mandated by the government who is also running the town's largest business, Octan. Through subliminal messages and pop culture control ("Everything is Awesome! "), the populace is simultaneously kept in line while feeling good about themselves and the choices they make, which exist in hyperbole of our own daily minutiae, such as overpriced Starbucks coffee and repetitive and denigrated sitcom fodder. Into this is Emmett, voiced by Christ Pratt, who despite desperate attempts at the contrary, is amazingly average. He doesn't even really have friends or close relationships, despite appearing relatively stable, if not deluded towards his own social life and existential purpose. His brainwashed, homogenized state serves a higher purpose, though, when he begins to enter the world of the Master Builders. The Master Builders are essentially all the weird LEGO bits with pre-ordained personalities like Batman, Gandalf, and Michaelangelo. It's first a statement of irony that the only individuals in the metanarrative capable of independent thought are those whose figures are already assigned cultural status based on the properties that inspire them. Cloud Cuckoo Land, as it is called (an unrealistically ideal state - thanks, Wiki, that I mostly knew from Banjo-Tooie) is this area where all these minds can gather and let their ideas flow without limit or contraction. This is ultimately an flawed state of mind as well, though, because with everyone creating their own plans and designs without communicating or working together, their individual contributions fail to create a complete whole. Only Emmett can represent the middle ground, the best of both worlds as you will, with his open mind towards both states of being. That's the meatiest chunk of the core LEGO story, which is a fantastically rich philosophical drama amidst some of the best looking animation of any recent non-Frozen (2013) and a hilarious screenplay. The movie wisely restricts its animation scenes to only LEGO bricks, except for the "relics," of course. Everything, from the water to the clouds, to even smoke and explosions is LEGO. It's part of the creativity that makes this brand soar. There's also these really trippy moments and bright, passionate colors that just work. 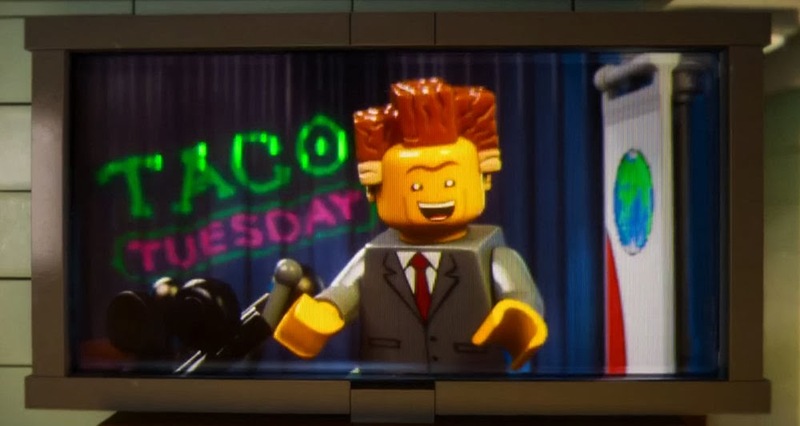 The real heart of this film, though, is when it switches to the real world and reveals that this tension between bureaucratic micromanagement and free-flowing creative chaos is really just a metaphor for the tension between the LEGO playing styles of a strict father and a kid just, you know, wants to be a kid. The kid is projecting this anxiety on to his sets and seems to be the proverbial "god" of this world, even though the characters essentially act like they would as if they were actually characters within a child's imagination who are not aware they are such characters. Emmett may still represent this balance though, as an independent arbiter. His ability to actually move in the real world suggests that the pieces do have some free will of their own, even though the kid, ostensibily a god, also seems to be controlling the story, although within the metanarrative, the character actions and motivations arise on their own accord. I might suggest a theory that while Lord Business is obviously Will Ferrell's real-life character, and most of the Master Builders symbolize the child's wishes, Emmett himself may just be Emmett as this character in-between who has a will of his own, even though still heavily under the influence of both Ferrell and the child. One of cinema's greatest Batmans. It ends up being a nice spin that much of the trope-busting is, within the metanarrative, due to the fact that the entire "story" is being dictated by a little kid. It's why the central theme song is the immature and reductive "Everything is Awesome." It's why Batman's personality is reduced to being a really cool but arbitrarily dark superhero. Just listen to his song. It's how a kid understands Nolan's Batman, which is how we should all understand him. DARK. BROODING. SELF-IMPORTANT. The LEGO Movie is leading the charge in New Sincerity. You have names like Lord Business and reductions of other tropes to the surface like Bad Cop / Good Cop, which on its own at first seems like a simple parody of common film conventions, but is really just a regurgitation of how a kid's mind would interpret and display a short lifetime of pop culture understanding. Other elements like the "Middle Zealand" letters remaining in the sky work as both odd pop culture jokes, fun trope busting, and by the film's end, a rewarding metaphor for the father's separation of worlds. As the song says, "everything is awesome," which really holds true to the cast of this thing. Even that song itself, performed by Teagan and Sara ft. The Lonely Island is a dream mash-up. The voice cast contains just about everyone from every good show on TV right now, including Parks and Recreation's Chris Pratt and Nick Offerman, Community's Alison Brie, Arrested Development's Will Arnett, It's Always Sunny in Philadelphia's Charlie Day and a slew of other big name voices like Morgan Freeman, Liam Neeson, Elizabeth Banks, Shaq, and Will Ferrell. Not too mention a little 21 Jump Street (2012) reunion with Channing Tatum and Jonah Hill voicing Superman and Green Lantern respectively. Did we mention a couple original Star Wars actors? This is also the only movie ever where you'll see Batman hanging out with Lando Calrissian, Dumbledore with Gandalf, and William Shakespeare with the 2002 NBA All-Stars. It's also frankly probably the best Justice League film we're going to get in a while. Added to all this is an intense showing by the brand LEGO itself. It plays with the two biggest LEGO conventions: building separate sets by way of the instruction manual or the fun of mixing everything up together to make something completely new. Along the way it's very knowing about its own history (was that Bionicle I saw?) and how people play with LEGOs (the child vs. father). My favorite reference was probably the 80s Space Guy who is of course pretty busted up and missing a visor. The thing is, not only does LEGO understand how people play with its sets now, but it understands nostalgia and how people used to play with their sets, and the collision of what used to be popular with current trends. It's a spectacular display of branding. Inhibiting this difference in playing style is the Piece of Resistance, which is really the cap to the Kragle (Krazy Glue), which both heals the relationship between father and son, and presents an end to gluing LEGOs together, which from a brand perspective is fundamentally flawed. It is also detrimental, though, to an in-world society perspective, and a creative kid's playing perspective, and provides the strongest symbol for healing the relationship between father and son. Thus, in one package, The LEGO Movie sums up all three of its theses - the core family rift is healed, the central conflict in its marvelous adventure story is resolved, and LEGO makes a bold statement about how its products should be used - to be broken, re-distributed and played with, rather than frozen in display. It may be the most significant problem of the movie that with all its philosophical cultural free-thinking debate, twisting metaphoric plotlines, and spot on humour and character development, it ultimately lands on only one central conceit - that playing with LEGOs is awesome. But that's true, so it's hard to fault them. There is a reason why this thing has cleaned up at the Box Office three weeks in a row - Everything is Awesome.